This puppy is the standard pick of the litter for a male, he has a personality that is most active and curious. He is adventurous and always has his nose to the ground. Murphy will be a pup that is tenacious in the field and loving in the home. Shows promise with bird drive and desire to please his human. We have sent pups to California, Washington, Idaho and all over Utah. Do not miss out on a puppy of a lifetime. The Sire is a seasoned hunter who has been hunted extensively: guided pheasant, chukar and quail hunts. Nash is a stout and powerful male weighing 55 pounds, he has a strong desire to please and a bird drive to go all day. Dam is a great family dog and exhibits innate qualities of the breed standards. Lowa is an affectionate family and field companion who loves to be with her family, she weighs 48 pounds. 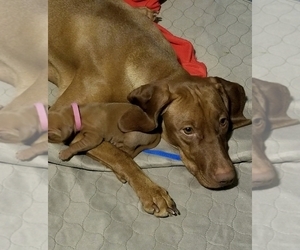 Overview: The Vizsla is a very energetic and fun-loving dog. They're also quite intelligent, thus learn very quickly. Gentle training makes them a great family pet. Coat: Short, smooth, dense and close-lying, without woolly undercoat. (The wire-haired variety is not recognized by the AKC). 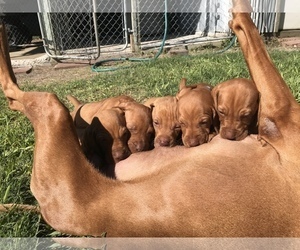 Character: Vizslas are a loyal and affectionate breed. Known for their intelligence, these dogs enjoy outdoor sports with their owners. Temperament: This breed gets along well with children, other dogs, and most household pets. They will bark at strangers. Care: The Vizsla with a short-haired coat requires very little grooming, but should occasionally have a rubber brush used to remove dead hairs. Training: This breed is easy to train because it is always eager to please. Use a consistent approach. Activity: The Vizsla is an energetic dog, needing lots of exercise and allowed to run free off the leash. Health Issue: This breed is prone to heart disease. Posted Breed: Vizsla / German Shepherd Dog (short coat). Adoption Fee: $150.00. 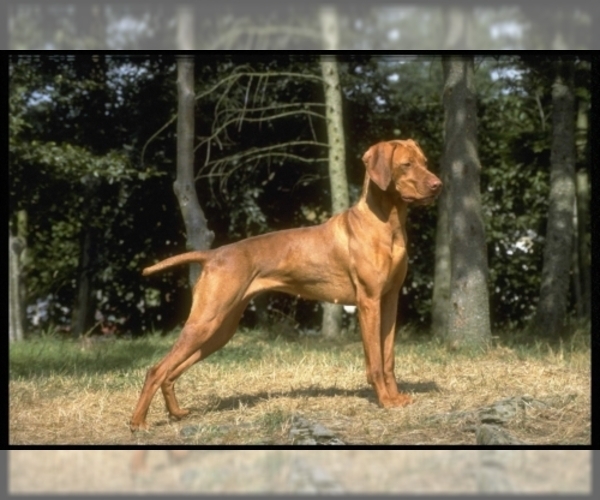 Posted Breed: Vizsla (short coat). Adoption Fee: 200.